I mentioned in a previous post that my sales/marketing skills are pretty weak. I keep working on them, and I have a few small successes but, overall, it’s just not one of my strengths. As a nerd, I have this strong instinct that a high quality product ought to just sell itself! Of course, I know this isn’t actually true — in fact, I advise other people that it’s not true! — but it’s still my back-of-my-lizard-brain bias, and I have difficulty thinking past the “but it’s a really high quality product!” phase of marketing. Them: So, what’s your gimmick? Me: I don’t have a gimmick. I kind of don’t like gimmicks. Them: Oh, but you need a gimmick — that’s how you sell beer! Me: Can my gimmick be that I don’t have a gimmick? 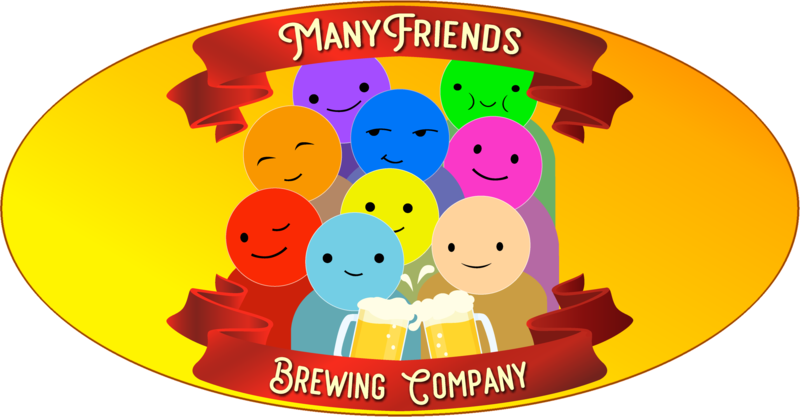 Me: You know, like, “ManyFriends Brewing Company: no hassle, no B.S., no gimmicks; just good, solid, premium craft beer to share with your friends” — that sort of thing. Them: Well, the “share with friends” thing could be your gimmick. Me: I don’t think I want to gimmick-ify the concept of “friends”. Them: Yeah, but you don’t know anything about marketing. I’m trying to help you, here…! …Then the conversation kind of goes downhill from there. Anyway, it’s a thing I’m continually wrestling with as the marketing-expert members of my team try to slowly ease me into the world of gimmickiness and I try to pretend like I don’t notice and I’m ok with it, at least for a little while. And, to their credit, they’ve been very patient with my obstinance, and I’ve been working on evolving my thinking. I mean, the company has some cool principles (bring people of diverse backgrounds together to enjoy each other’s company — “ManyFriends”), we support some cool causes (we’re devoted to improving the environment and giving a hand-up to kids who don’t have access to all the advantages that we have/had growing up) — I think where I get stuck is: that’s just who we are, and not a something that I’m comfortable playing-up just to make a few extra bucks. I think part of the disconnect — at least this is what I pick up from conversations — is that folks keep talking about how Coca-Cola and Budweiser and similar all do all of these giant marketing-blitz campaigns and I keep thinking: but I don’t want to become the next Budweiser or Coca-Cola. I don’t even want to be the next Anchor Steam or Sierra Nevada (both find products, btw — I’m not dissing their beer!). My goal isn’t to become a mega-brewer and I don’t have an “exit strategy” that involves, as we used to say in the 90s, “…and then get bought out by Microsoft” (in beer terms, replace “Microsoft” with “ABInbev”). I really have this idea of just keeping it to a small, family-owned & operated company that focuses on making premium quality product in support of our loftier goals: world-peace through bringing strangers together, a healthy & beautiful environment and providing paths-to-success to those who wouldn’t otherwise have them. I’m not looking to make millions; I just want to earn a decent living producing something of which can be proud and make the world a better place*; maybe leave behind something that’ll make my daughter’s life a little nicer 🙃. #sigh — Marketing is hard!!! *One of these days, I’ll write a post about my “Think Locally, Act Globally” campaign.